Our annual golf tournament is at Northgate Country Club on May 6, 2019. Cost – Includes green fees, cart, range balls, professional scoring, lunch, dinner, refreshments and tournament prizes. Sponsorships – Sponsors are a welcome and essential part of making this event a success. 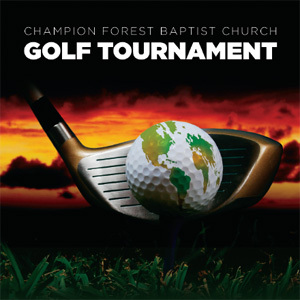 All proceeds will help send students to serve others in the mission field and bring students from our community to be a part of the ministry of Champion Forest Baptist Church. Gold Sponsor $650 – Entry into the tournament for (1) one team of four players. Includes a hole sign with company name and contact. Platinum Sponsor $1500 – Entry into the tournament for (1) one team of four players. Exclusive sponsorship on one of eighteen holes with a custom color banner with the company name and logo and a hole sign. Titanium Sponsor $2500 – Entry into the tournament for (2) two teams of four players. Exclusive sponsorship on one of eighteen holes with a custom color banner with the company name and logo and a hole sign. Corporate/Golf Towel (Give-a-Way) Sponsor $7500 – Titanium sponsorship privileges. Company name and logo on a tournament give-a-way. Recognition at dinner. Missions Sponsor $10,000 – Titanium sponsorship privileges. Company name and logo on a tournament give-a-way. Sponsor supplies needed for mission trip. Recognition at dinner. Additional sponsorships are available for dinner, putting contest and contest holes For more information please contact Nancy Cook at 281.586.8750.